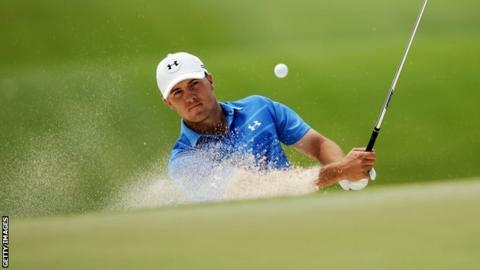 Jordan Spieth fired a course-record 63 in the final round to win the Australian Open by six shots. The 21-year-old American surged to an aggregate score of 13 under par, comfortably securing his second professional title. "It was the best I've ever played," said Spieth of his flawless round, which included eight birdies. World number three Adam Scott was fifth on four under, while defending champion Rory McIlroy finished 15 shots back. The Northern Irish world number one was one shot off the lead midway through the tournament, but a disastrous third round followed by a mediocre final round of 72 left him in a tie for 15th. "With the pin positions and the wind, it was just very hard to get the ball close to the hole," McIlroy said. "It just wasn't meant to be this year." Instead the day belonged to Spieth, tied for the overnight lead, who secured his first triumph since last year's John Deere Classic in emphatic style. The Texan, who finished runner-up at this year's Masters, becomes the first American winner of the Australian Open since Brad Faxon in 1993. Australia's Rod Pampling, who was one shot off the third-round lead, finished second on seven under, while his compatriots Brett Rumford and Greg Chalmers, who began the day level with Spieth, finished third and fourth respectively. All three gained automatic qualification to the 2015 Open Championship.